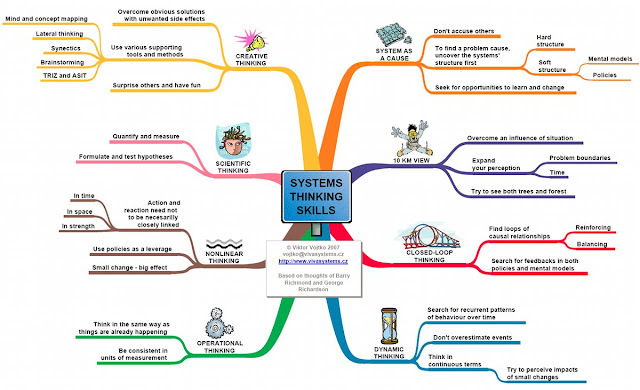 These posts explore issues related to learning and teaching for the 21st century, with an eye toward promising practices and how to make systemic change happen. Sponsored by The Council on 21st Century Learning. 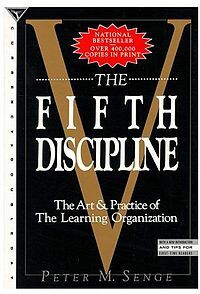 Peter Senge, author of The Fifth Discipline and perhaps the nation's most recognized advocate of systems thinking, made a brief series of presentations to educators and businessfolk in Denver last week. Organizers of the sessions framed them as an opportunity to bring educators and businessfolk together to talk about transformation in education through systems thinking. (That's a mouthful.) In the two presentations that I attended over approximately three hours, Senge wove together powerful and important ideas -- including business innovation, education reform, learning organizations, and dialogue -- in a way that seems important to rethinking education. I've excerpted my notes* from the presentations below; perhaps they'll prompt some transformational thinking. *These notes paraphrase in detail what Senge said, quoting him as directly as possible (using a keyboard). I've rearranged a few paragraphs to enhance (I think) the flow of ideas. I've also added the italicized headings that mark what I take to be the thread of major topics Senge discussed. First, we need to understand the difference between learning and information exchange. "Learning is a process whereby we enhance our capacities to produce the results we want to produce." To ride a bicycle. Or talk. It's behavioral and cognitive, or physical (like how to make certain sounds). It's all of them at once. There aren't any teachers. By which I mean we don't learn the key things by sitting on our butts and being told information. Mentors, yes -- people ahead of us in knowing, and showing us a way. But teachers, no. Learning is both very personal and instinctively social. Master teachers are really master mentors. We're on the cusp of profound changes in our schooling. Which has never been much about learning, but more about socialization and getting kids through a curriculum that the adults care about. Delivery of content is less and less what schools are going to be about; educators are going to have to give that up. The opportunity in this is that schools can be more focused on the social aspects of learning -- the soul of real education, which is kids learning together, learning how to work out their differences, learning how to work together. The best class I've seen is an 8th grade algebra class: The teacher rarely talks more than 5 minutes. The kids teach each other. If I see a classroom with straight lines and individual desks in rows, I say, you're still teaching; you're not fostering learning. Kids get habituated to having a teacher. But for the rest of their lives, they won't have one. So they need to get used to that. From "Design Pattern: Bringing It All Together,"
I observed this algebra class along with several school leaders from Armonk, New York (global corporate HQ of IBM). The visitors were stunned. First, Rob (the teacher) didn't have to start the class. The kids started it themselves, working their way through their respective math exercises. Rob just talked with the visitors about what the kids were doing. The kids worked in groups of four, which he regularly reconfigures. He assesses by talking with the kids each day, and coordinates each student's learning based on these assessment conversations. If you brought a typical principal/evaluator into this class, the teacher would probably get low marks. But the kids are learning algebra and how to deal with the social aspects of learning and working together. One of the Armonk observers, a principal and former math teacher, said, "I've never seen a class where the kids did so much smiling." There's a collaborative context for all of this. We look at exceptional teachers and ask, "How did they get there?" What are the good developmental processes? It's intensely collaborative. Current concern about teacher quality isn't really leading people to look at the developmental process for teachers. Collaborative learning. Reflection. Dialogue. Deeper conversation. Building trust and mutuality, while dealing with difficult issues. Building collective capacity to have difficult conversations is the key learning we all need. My network of educators tell me that the biggest single difference in their systems is the ability to have difficult conversations without having the train come off the tracks. It's a cultural and personal problem, collective and individual. If you're serious about this point, you spend your whole life working on it. There are always near horizons. You reach them, then another horizon lies beyond. When you're really stretching, there's never enough time. You need to show up in an ongoing way. You have to be coached. But you have to want to be coached. It requires a voluntary act. To build capacity, you need tools and methods. It's not about ideas; it's about tools. Theories, tools, and frameworks. We start with theory, then go to tools, then go to frameworks for seeing how a conversation can occur. Have you ever noticed that in a meeting the real subjects do not get discussed? They get discussed in the ladies room afterwards, or over beer at a bar. They don't get discussed in the meeting because folks are defensive. "Undiscussables" is a key concept of management. One definition of a management team is a group of people with an average IQ of 120 and a collective IQ of 63. We're polite, but with no energy. You hope the meetings are short - because the longer they are, the more time that gets wasted. When we get out of Politeness (Stage 1), we often drift into Debate (Stage 2). It's edgier. The ties come down, and we really talk about what's going on. Does anybody's mind get changed? No. You wouldn't call it collective inquiry or real conversation -- where people actually start to think differently, where I take in something that somebody else says and change my thinking. Stage 3 is Real Conversation. The shift to Stage 3 isn't trivial. Usually we just go back and forth between Politeness and Debate. A real working team develops the collective capacity to move into what historically was called dialogue. Interestingly, the root word (dia-logos) literally means "flow of meaning." Through Dialogue we can reach Stage 4: Inquiry. Where we experience a genuine flow of meaning. I'm told there's a Sioux expression: We talk and talk until the Talk starts. Every culture deep in its roots has an understanding of the evolution of conversation. Yet I think we've almost completely lost it here. It's not about education but about our culture. 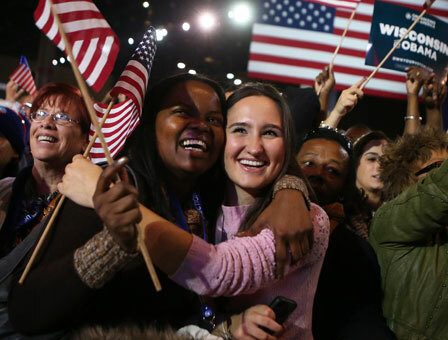 When voting started, democracy ended. The action replaced the deeper essence. Conversation is the root of all forms of self-governance. We're seeing the tragic consequence in our nation. That's a useful framework. 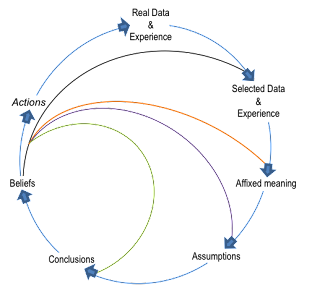 Groups usually follow a progression through the stages, though not always. Anthropologists developed the tool called the Ladder of Inference. The basic problem of anthropology is to understand a culture that's really not your culture. How do you do that without injecting your frames of reference? The discipline starts with making rigorous inferences. At the base of the ladder lie data -- observations and descriptions. Directly observable phenomena. Nodding a head. What a video recorder records. We have individual variations. Then culture layers (family, society). Indeed, the best definition of culture is "implicit patterns of interpretation." So we start with data. 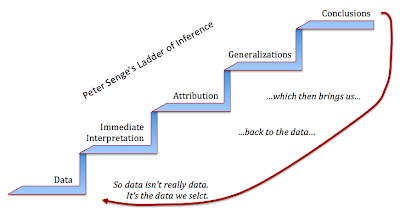 What the data mean is interpretation - inference. We don't explicitly say these things to ourselves, we just assume that the inferences we make are the data. The second rung of the ladder is Immediate Interpretations. These are almost all implicit. They happen at the speed of light, conditioned in us culturally. For instance, I observe a man nodding as we speak. My immediate interpretation: He agrees with me. But in some cultures, nodding means "I'm listening." In others, it means "I disagree." The third rung is Attributions. Attribution is the assumption I make about someone's reasoning or motives. The fourth rung is Generalization, in which the attributions are taken to broader levels of interpretation. Here, stereotypes really play a major role. From "Inferences - Meanings We Create"
on LifeSystems 101 (accessed 11-24-12). These interpretations are inescapable. They're human. You can't not make inferences, attributions, stereotypes. The problem isn't that we do it, but that we don't see it. We treat our inferences as if they were data. [emphasis added] This is the biggest problem in communication. We make a bunch of automatic inferences, and then treat them as if they're Fact. Because the sense that we make is powerful, and it trumps the data. We give it meaning. And the meaning we ascribe is what sticks. Our opinion is more powerful than fact. You have to start by being dedicated to being aware of your awareness. Separating what's said from what I heard. We think what people hear is what we say, but they're two different phenomena. As you acquire a discipline, then you start by saying what you think someone said. And then what you think about it. Step 1: What's the data? Step 2: What's the meaning? This theory applies to all the ways in which humans interact. What will it take to build a partnership between business and education that will sustain the kind of innovation in education that the society needs? A Canadian business leader once said to me, "I've been called in so many times to consult with educators; I've been on so many committees. Whenever I've been called in, it's because there's a crisis. No one's ever asked me to help with innovation. I wonder why." 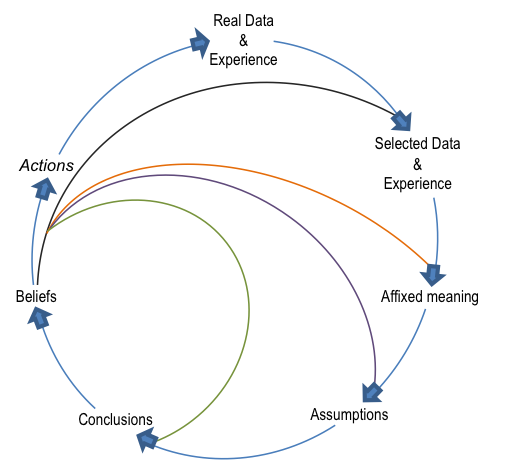 A suggested causal bubble for business innovation. 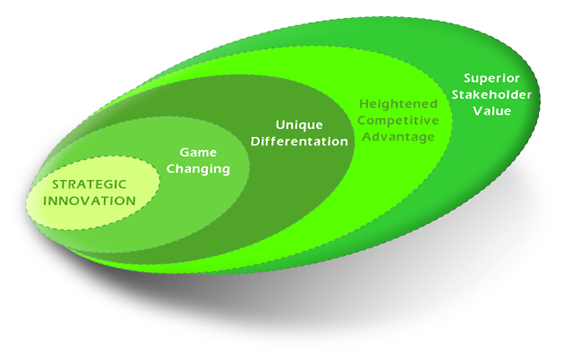 From "IC<=> Innovation Capital <=> Strategic Innovation,"
on ic knowledge center (accessed 11-25-12). "Innovation" and "schools" are two words that don't get put together very often. In business, if you don't innovate, you're dead. 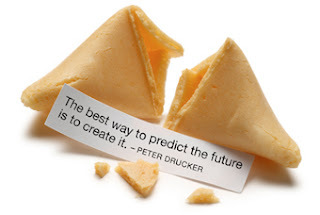 Innovation creates new sources of value. If you don't do that, you're not around very along. Why don't we have that same mindset for our schools? Maybe we don't think schools should innovate. Maybe we think if they just do what they did when we were kids, that's great. But are the answers of 30-40 years ago really the answers we need today? Maybe we don't think schools can innovate. Over the last decade or so, the frustration among business people about education has grown dramatically. Few businesspeople will say so publicly, but privately they've given up. "We hire from all over the world, so it doesn't matter all that much." After years of various reform efforts, I think there's an attitude of profound frustration. Which exists in teachers as well. By the way, I have trouble with the language here: How many of you would like to be "reformed?" Or have them reform us? But this is the most common word we use when we talk about change in education. In business we talk about innovation. It's interesting why we think this way. Why we don't think education needs to continually innovate. From "ITIL is Continual Service Improvement,"
Business people often don't appreciate the complexity of education as an institution. In the early '90s an effort was made to bring Quality Management to education. When done well, Quality Management practices build know-how in an organization; done poorly, they destroy trust and twist performance into metrics. And the application to education turned out to be a bunch of metrics. In 1992, I attended a session of education leaders in New York City. I was on a panel with Ed Deming. He said to this group, which he could see was intent on setting targets, making them measurable, then holding people accountable for reaching them: "You are in the process of trying to apply to American education a system of management that has almost destroyed American business." They went ahead and did it. Setting targets and measuring people is the wrong story for building partnership. You build partnership around ideas. But this is difficult. We can say all the right things, but that doesn't mean we're getting anywhere. Here's what I think about innovation -- actually, what Peter Drucker thinks, about innovation. 1. You must have a very clear sense of mission. And making money can't be the mission. Profit is like oxygen. If you don't have enough of it, you're done. But your purpose isn't to breathe. Businesses exist to create value for society. Social and economic value. What's the implication for education? Do we have any consensus on the mission of education? Without real effort to clarify our aims, almost any aims will do. We create a vacuum in which things like test scores become the aim. It's hard to find school systems that have had a serious, multi-stakeholder process of working together to come to consensus about aims. I know of one system - a rural/suburban district in the Seattle area - Tahoma. 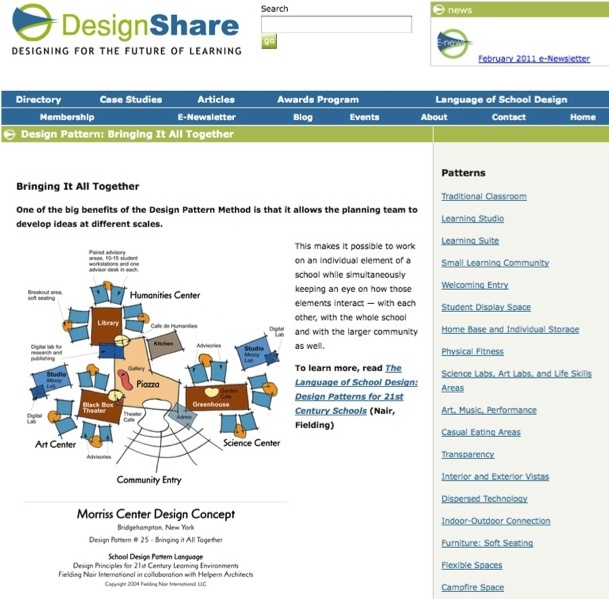 Their website presents six aims - develop students who are complex thinkers, self-starting learners, self-critical learners, collaborative workers,… These goals were developed in 1991. The district convened meetings of stakeholders for a year - community, teachers, business, students, parents,... They primed the pump with various ideas, then they talked it through. Is Tahoma's list of goals the answer? No, it's that district's answer. But until there's consensus on your mission, why take risks? Innovation is a fuzzy word, but one thing is certain: You make a lot of mistakes. Software designers say, "Fail fast and early." It's risky. But if you don't take risks, you don't innovate. So you have to have a reason - an inspiration. 2. You must translate the mission into compelling vision statements that you're prepared to measure in order to assess progress. Vision statements are "desired results." Of course you have to measure. But how you measure is crucial. The critiques that thoughtful educators have made of standardized tests are important. "I don't teach to get good test scores." A lot of the most compelling visions of businesses aren't accomplished. But they stretch people in the attempt to reach them. 3. You must have relentless assessment and correction. You'll fail a lot. Assessment is tough. It means being always open to seeing what's not working -- and fixing it. But in order to have continual assessment and correction, you must have trust throughout the system. In order to have trust, you must have relationships that generate trust. In order to have the relationships, you must create good conversation, and you must assure everyone's safety. If everyone is in fear in an organization, you don't have trust. Safety is a sense of mutuality. Healthy social relationships. Of course there's more, but these are the basics. Why hasn't it been applied to education? Innovation is messy, and involves a lot of errors. It requires a certain environment - with measurement of meaningful outcomes, in which we all acknowledge errors and seek improved outcomes. It's important that we're sitting together in this room. Now, here together to do what? Hopefully, this afternoon enables us to plants seeds for real dialogue. What seeds do you want to plant? What questions do you have? Downtown Denver, seen from City Park Golf Course. Photo by Stevan Kalmon, November 2011. Driving home across Denver on a recent evening, I had the opportunity to reflect on the relationship between privilege and housing/neighborhood design. I travelled from Green Valley Ranch, at the eastern edge of the city, to my house on the western edge. (I was coming home from a golf lesson. Yes, a golf lesson. This embarrassing fact becomes relevant in about four paragraphs.) From GVR, I followed surface streets west and south and west through Northeast Denver, Stapleton, Park Hill, City Park, Five Points, Downtown, LoDo, Platte River Park, Jefferson Park, and finally to my not-Highlands/not-Colfax area... It's a fascinating -- and highly learningful -- drive. Huge diversity of neighborhoods. Some fine views (like City Park, with the stylized Denver cityscape rising to the west). And much to consider related to the makings of a 21st century American city. As I was cruising along Martin Luther King, between Havana and Quebec, flanking the northern boundary of the Stapleton developments, I marveled at how much nicer the housing looks there than it does along, say, Tower Road in northeast Denver. "Nicer", of course, according to my subjective and culturally manifested judgment. Why do I think so? What makes me think so? How do I think that I have the standing to think so? 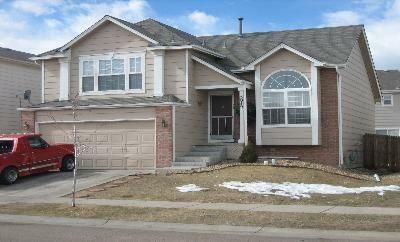 Are the houses in Stapleton better built? Why might they be? 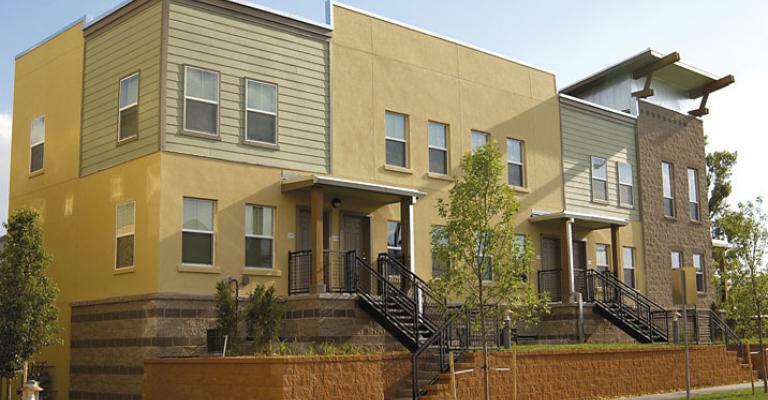 What economic decisions ordain that some housing has to be "ugly" and/or less well built? What would it "cost" to plan and build all housing with the same attention and care that was devoted to Stapleton? What would such an investment return? Why did the Stapleton and Lowry developments get so much more attention than the Montbello, Gateway, Northeast, and Peterson developments? As these areas continue to build out -- and when simply everyone thinks that Stapleton is a model of urban housing development but the northeast areas aren't -- why is it that more effort isn't made to emulate Stapletonesque features in the Northeast Corridor? Who is paying the costs of not making more such effort? Whose responsibility is it to make the effort? And who decides whether it will (or won't) be made? After musing along these lines for some time, I suddently thought, What a study this would be? What learning! I'd like to be teaching in a school that makes this its "curriculum." Perhaps an ongoing study for one cohort of students -- starting when that cohort first enters the school (like 9th grade, or kindergarten) and concluding (officially) when they graduate. 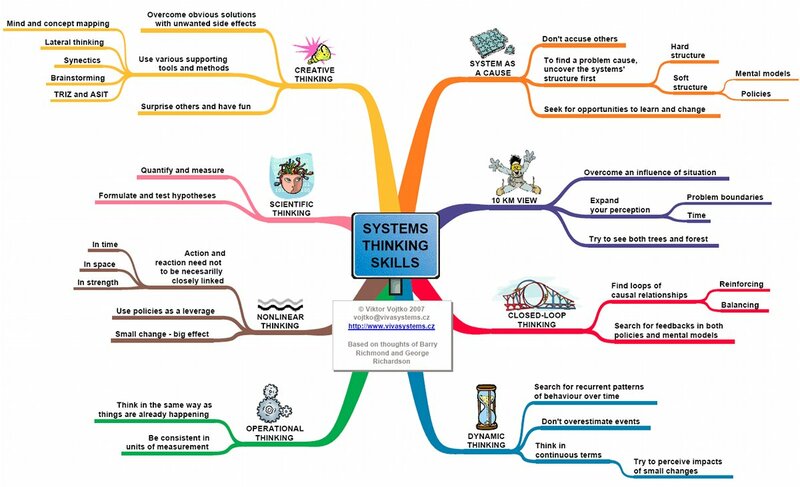 From "Systems Thinking," Part 3 of "Clinical Microsytems: Transformational Framework for Lean Thinking," published on the ASHP Foundation website - http://www.ashpfoundation.org/lean/CMS3.html. Last update, 9/17/12. See blog rants about learning for the 21st century, how we learn, and inquiry. on the Glamour website (accessed 9-10-12). Still. Here we have a whole world from which to learn; instead, we teach classes in civics. * Accomplished Teacher by SmartBrief - News about teaching and education excellence; November 8, 2012, edition is exceprted at http://r.smartbrief.com/resp/dZgyDlrblMeSsSuMfDfIgkfCSlYU. 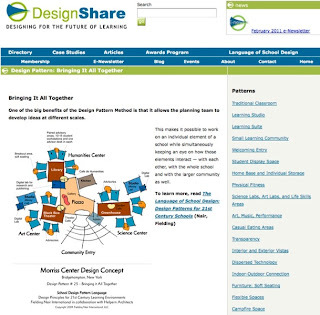 © Council for 21st Century Learning, 2011. CC: BY-NC-SA. Simple theme. Powered by Blogger.